It’s difficult for me to say why I connect with a particular painting. My background is in graphic design. So, naturally, I’m drawn to paintings that reflect the principles of graphic design. Negative space and contrast are two key principles that I believe should also be present in a painting. In October Bounty by Dara Daniel of Miranda, California, the negative space created by the curve of the tree trunk and the birds at the bottom makes the picture for me. The placement of the two birds against the teal color creates a nice contrast. 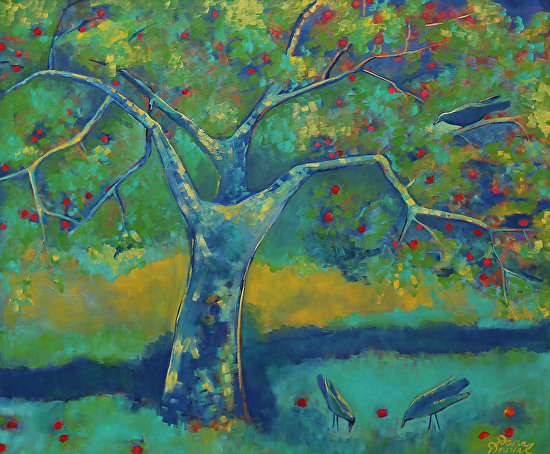 The bird in the tree helps to tell more of the story, but it’s the negative space occupied by the two birds on the ground that creates the focal point of the painting. I believe that all paintings should have a focal point — a part of the painting that draws the eye to one area first. 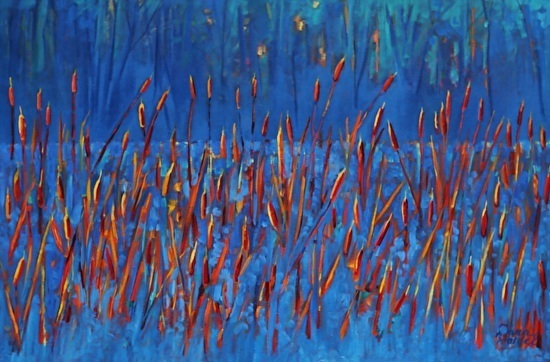 Another painting by Dara, First Light, reminded me immediately of Piet Mondrian’s Red Tree. 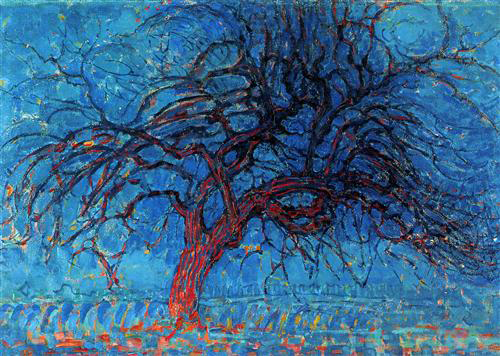 One of Mondrian’s earliest paintings, Red Tree was the first in which he implemented his color palette of red, blue and yellow—the three primary colors that are so prominent in his last paintings, such as Broadway Boogie Woogie. After achieving an MA with an emphasis on sculpture, Dara turned to oil painting in 2011. Today, she translates her love for nature into landscape paintings. Her original artworks are available at her website, www.darasfineart.com, or at www.LagunaArt.com and www.ugallery.com. Posted in Best Bet and tagged best bet, focal point, landscape, Mondrian, negative space, The Red Tree. Bookmark the permalink.